Last week I managed to expose Jim Jefferies and Comedy Central for producing a disgusting fake news story about me. Too often the mainstream media get away with these crimes. They misrepresent stories and individuals, they ruin careers and feed an ugly, divisive narrative. But these fabrications don’t just affect people targeted by the media – they affect every day citizens – people like you and me – who are being fed LIES. These journalists, writers and personalities go unchallenged. Their actions have zero repercussions. Last week, I challenged this dishonesty, and won. But, unsurprisingly, the shocking footage I released has been ignored by most of the mainstream media. The SAME media who allowed me to be misrepresented in the first place. The same media who continues to lie to YOU. The worst part of this story is that my experience is not uncommon. It is shared by many people who dared stand against left-wing narratives – who then find themselves reprehensively lied about and their words distorted by dishonest editing. In fact, when I posted the footage on Facebook, I was PERMANENTLY banned! But these social media giants allow Jim Jefferies and his ilk to continue to operate. And we know what they are doing is wrong. I’ve had enough. And I won’t give up. 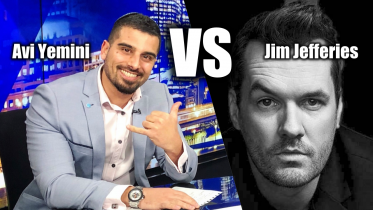 I’ve been invited to appear on several American shows, such as The Rubin Report and Louder with Crowder, and others who want to help hold Jim Jefferies, Comedy Central and the lying media to account. This is not just about me – it’s about the hundreds of thousands of people who are lied to on a daily basis and all the individuals who cannot face the lying media themselves. As a result, I’ve decided to do this tour! I’m excited to announce that Sydney Watson has agreed to come! But we need your help to cover the expenses. I’m going to go on every show that will have me on. I’m going to Comedy Central to demand answers and I will even try to get Jim Jefferies to finally answer for his dishonesty. The media have gotten away with this for too long. It stops now. We need your help to cover the international flights from Australia and internal flights in the states. We’ll also need basic accommodation. None of this would be possible without your generous donations. Every dollar helps. Click the button below to help us fight the dishonest media.